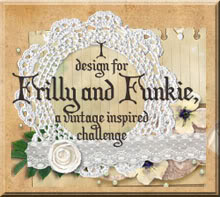 Jenny, you did a wonderful job as a Frilly designer! I love this card for it's rusty elements and wonderfully layered Worn Wallpaper; a real favorite of mine from the TH Holiday release. Gorgeous card, as always! Hugs! Ooooh! Those berries look good enough to eat! Loving the rusty Christmas theme you have going on here. Really beautiful, Jenny, as is everything you make! Love the rust effect, and the berries are perfect! This is brilliant! I adore the layers of the wallpaper with the soft whitewash and then the grungy rust kitchenware! Fabulous! I spotted the spoon right away and it fits so nicely tucked in among the festive foliage. Love the background and the wonderful layers.